From the largest elephant to the smallest shrew, the city of Zootopia is a mammal metropolis where various animals live and thrive. This Zootopia Mystery Minis Display Case contains 12 blind-bagged mini-figures. Ages 3 and up. 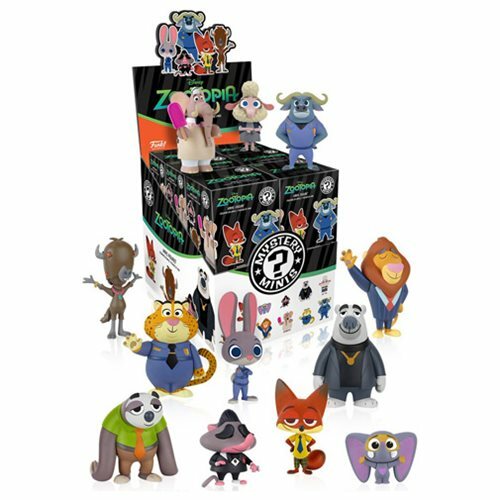 The individually packaged blind box figures may include (subject to change): Nick Wilde Judy Hopps Flash Mr. Big Jerry Jumbeaux Jr. Yax Ele-Finnick Chief Bogo Officer Benjamin Clawhauser Polar Bear Leodore Lionheart Bellwether Breakdown not available at this time. Please note: Item selection is random. Items are in blind packaging. We cannot accept requests for specific items, nor can we accept returns on opened items. You may receive duplicates.